Ah, the infamous achievements for single player games where you need to play with others in order to unlock. I hate those. I really wish...really, really, really....that you could turn these things off! OCD is no fun, we all know it, xist, multi cheevos are the worst! Completed Darksiders 2 the other night. That was quite the grind. Definitely my least favorite of the series, but still a fun time. My Rarest Achievements showcase on Steam is also dominated by Rise of the Tomb Raider achievements, which I found quite strange. New day, new year, new goals. My best year was 2016 where I unlocked 2,131 achievements. Note: I played none of the achievement trash games to unlock achievements. Fortunately, Switch has no achievements and month by month I'm appreciating it more and more. and done, started it two years ago, 100%-ed, devs added lost of content with cheevos like a year ago. 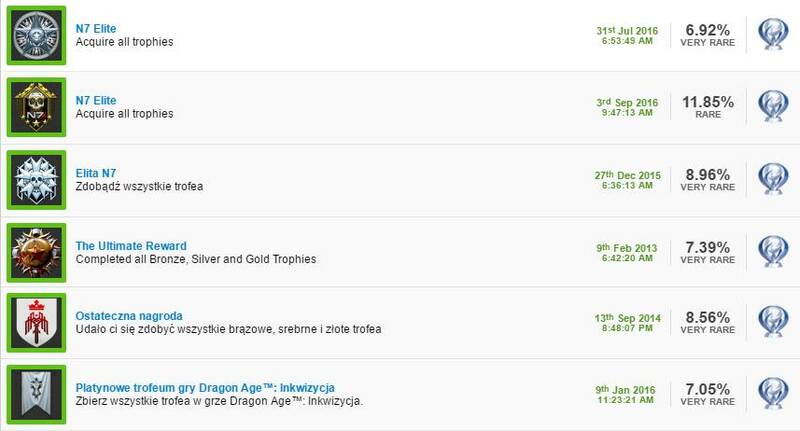 100%'d Witcher 2...feels good! I still really wish Steam would let you opt out though. Yeah honestly multiplayer achievements are the worst, I avoid them whenever possible. The rarest is a 0.20% achievement from Pillars of Eternity where you had to go through the entire game with 10 or fewer rests I think. It wasn't that difficult when I went for it, but that game had a lot of (unnecessary) balance changes so I'm not sure how it stacks up now. The pastel ones are from Gone Home and are really easy, it's just that people haven't gone back to the game since the achievements were added. The rest are from Gauntlet, and they're just grinding enemies, so also not difficult, just time consuming. I'd say the game I'm most proud of 100%ing is Super Hexagon lol. I apparently have 348 achievement games in total, so I'm about 30% done I guess. Finally made it up to 40% achievement completion on Steam, and the one I did it with was the Puff-Puff achievement in Dragon Quest XI. Still working on completing DQXI. I've got 6 achievements left so hoping to get it done this week. what's odd about it? It's not a hard to get achievement. 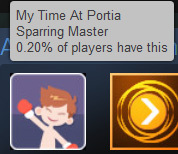 Like most achievements in Portia, I think it's mostly because it takes time. I'm personally not looking forward to those about 50 wins at Rock-Paper-Shissors and that other minigame with the old guy in the park. Anyway, I'm stubbornly trying to get all the achievements in Book of Demons. It's now a matter of principle. I'm missing the ones for upgrading all the warrior's cards (mostly because I was inexplicably still missing 3 base cards with my latest character...) and the one about dying 10 times in Roguelike mode. I've got the one for dying 5 times before losing my character to a stupid death. I hear you, I'm so not looking forward to RPS and some other games too, I also still question if that slot cheevo is at all possible. Oh, I forgot about that one. But it still shouldn't take as much as the RPS one. Usually slots machines in videogames are predictable and you only have to figure out which item you need to focus on before pressing the button. I've already tried twice with hitting the button while the sword appears, as it was easier to spot, and I've got the same results: 3 steaks. I'll try again with a different item next time. Seeing this makes me really embarrassed that I'm yet to even start playing Vanquish, despite having pre-ordered it. My backlog has really reached ridiculous levels. I'll have to give it a try soon. I played the demo on my xbox 360, and enjoyed it, but my console broke down, so this will be the first time playing the game. I don't really aim to get a "Perfect Game." I just try to get as many achievements as I can before I get tired of the game and uninstall it. Kinda crazy I only dropped to #2 after I stopped trophy hunting 5 years ago. 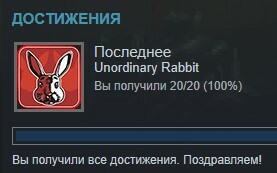 Achievements did unlock, although the notification didn't show the achievement icon. Unlocked achievements are stored offline until the next time you go online. I think you need to have started the game once after you go online before the unlocked achievements info sends to Steam. Unlock time is incorrect. Once Steam registers all unlocked achievements that were unlocked when offline, it the unlock time will be when Steam registers. I am not sure if this is for all games. Maybe it has changed since Civ5? Now at 114 games with 100% on Steam after getting the last Return of the Obra Dinn achievement and finishing Glass Masquerade 2 on hard mode earlier this week. Not sure I'll ever buy stuff on EGS yet, but thought this might be of interest.